Since 1994, the group has become a leading organization serving black lesbian and bisexual women by fostering visibility, empowerment, and leadership with programming that addresses health needs, networking and socialization, and social justice issues. 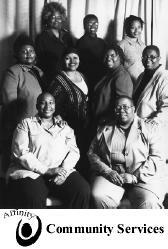 Affinity Community Services is a non-profit organization currently serving Chicago’s black lesbian and bisexual women’s community. Affinity has emerged as one of the leading community service organizations dedicated to black lesbians and bisexual women and has successfully addressed community needs through a combination of educational, social, and community collaborations. One of the Affinity mission’s central elements has been creation of opportunities for visibility, empowerment, and leadership for black lesbians locally, while serving as a national organizing model. As a result, Affinity has become the largest such organization in the Midwest serving the needs of these communities. Beginning in 1994, Affinity evolved out of efforts to respond to a lack of services on the South Side. An initial idea was to work toward creating a South Side community center that would provide a safe, accessible environment committed to fostering “wellness.” At that time, a needs assessment tool was developed to identify what resources and services community respondents found important. The compiled data from more than 200 persons helped the group to secure its first operations grant from the Crossroads Fund in 1996. Today, its budget has grown to nearly $100,000, and the group now comprises a volunteer corps of more than 50 women, a full-time staff person, five main programming components, a governing board of eight women, and a constituency base of more than 500 women. It is outgrowing its Hyde Park neighborhood offices. Its programs include Forty Plus (socialization and networking for those over 40), the Healthy Woman Series, Lez Chat (for those between 25 and 40), a Social Justice Committee, and the “Xpressions of You” Youth Program (for lesbigay youth from 18 to 25). Affinity recently won a grant from the Gay and Lesbian Medical Association’s Lesbian Health Fund to conduct an innovative health promotion program for African American lesbian and bisexual women. Women often come to Affinity without having had an opportunity to experience community, participate in leadership, or have an impact on program initiatives. They come at all ages, they may be just out of college, unhealthy relationships, or marriages, or they may have moved here from other states. Affinity offers them a black-female-managed agency that is providing comprehensive and supportive services for black lesbian and bisexual women.